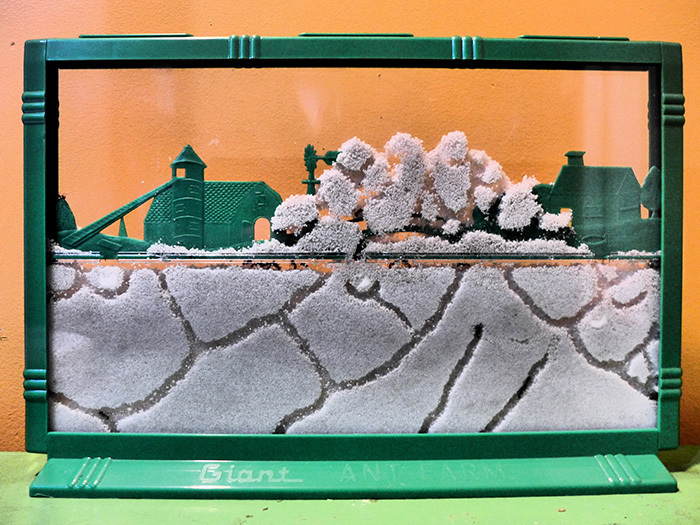 Day 1: We have received the ant farm and have filled it with the accompanying perlite. 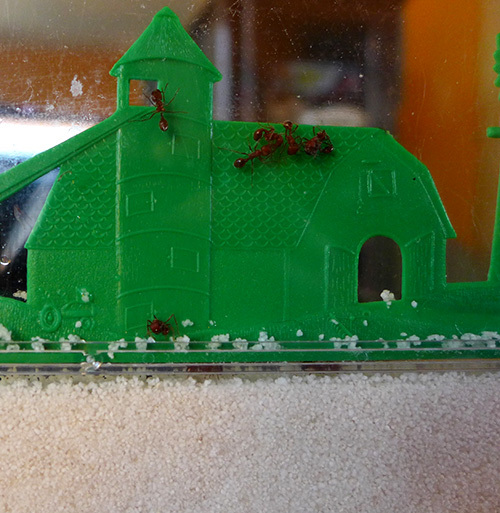 The harvester ants are coming from California, and will arrive on Day 2, by mail. About 30 ants should arrive, hopefully with their life and limbs intact, according to the documentation provided. Day 2: The ants are here. 20 dead. The rest, about 25 alive, look visibly upset. Since they left their travel tube they have been cleaning the stink of the dead off of themselves. They also appear hungry and thirsty. We give them some walnut crumbs and they go to town. They drink up some water out of a wet cotton ball. Satiated, some rest and some start to dig. Day 3: They have connected all three openings below the plastic horizontal divider and there is a tunnel going down. It is about a half-inch long. The ants have also created an area to clean themselves in, between the divider and the sand. This seems like a very important ritual. Day 4: Now there are two tunnels. One is u-shaped and approaching the top of the sand again to create a new entrance. Will they keep going? 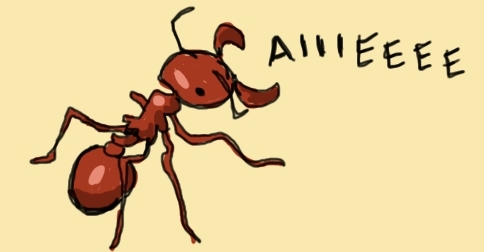 We see a five-legged ant, working as hard as all the others. We name her Brumhilda, for no particular reason. Day 5: There are three tunnels now. The ladies are working hard. Because there is no queen ant, they have no child-rearing duties to perform. They dig and dig and dig. Purposelessly. They will continue to dig, until they cannot dig. Then, they will probably cover up some tunnels and dig new ones. They will always dig. Day 6: A dead ant appears among the colony. It appears to have had its legs torn off. We attempt to remove it from the farm, but cannot reach without disturbing the other ants. Later, they carry the corpse around for a while. Is this an ant funeral? Day 6.5: The ants appear to have buried the dead body, but propped the head up on a mound. We remove both. Day 7: It seems like there are a thousand tunnels. They have even stacked sand on top of the plastic horizontal divider and made tunnels in there too. You can see tunnels from both sides of the farm now. They basically cover all available area without it just being an empty rectangle. Day 8: A fog comes over the colony. The humidity in Newark is 85% or more that day. We can hardly see the ants through the condensation. We place a piece of paper towel into the farm, to soak up some of the moisture. Day 9: Today it is time to feed the colony. We drop a candy sprinkle into the farm as a treat after we fed them some more walnut crumbs. We accidentally hit one with the sprinkle. All 24 start screaming, screaming, screaming. We cannot hear them. They are all running too, so excitedly that they trip and spin all over the habitat. After about a minute, they eat the sprinkle. Day 10: The ants are gone.